The American Thoracic Society (ATS) and the Japanese Respiratory Society (JRS) have published new clinical practice guidelines for the diagnosis and management of lymphangioleiomyomatosis (LAM), a rare lung disease that primarily affects women of child-bearing age. The guidelines are published in the issue of the ATS’s American Journal of Respiratory and Critical Care Medicine and are available. 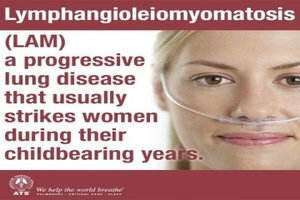 LAM is a systemic disease that affects about five per million women. In patients with LAM, neoplastic smooth muscle-like cells arise from an unknown source, infiltrate the lung and result in cystic changes. Lung function declines at two to four times the normal rate, often punctuated by repeated lung collapses. Most patients are breathless with daily activities and require supplemental oxygen within 10 years of onset of symptoms. The European Respiratory Society published comprehensive LAM guidelines in 2010. Over the last six years, however, rapid advances in LAM science have identified an effective treatment and a useful diagnostic biomarker. LAM experts within the ATS and JRS communities joined forces to develop recommendations for these new diagnostic and therapeutic tools. The guidelines, written by a 27-member multidisciplinary committee of clinicians and scientists, make five recommendations related to the diagnosis and treatment of the disease based on a systematic review of medical studies published through May 2015. The strength of the recommendations and the quality of the evidence supporting them were rated using the Grading of Recommendations, Assessment, Development, and Evaluation, or GRADE, approach. Joel Moss, MD, PhD, deputy chief, cardiovascular and pulmonary branch, of the National Heart, Lung, and Blood Institute, and Francis X. McCormack, MD, director of the division of pulmonary, critical care and sleep medicine at the University of Cincinnati, chaired the guidelines committee. Input from LAM patients was obtained through a questionnaire distributed by the LAM Foundation. For patients with LAM with abnormal/declining lung function, we recommend treatment with sirolimus rather than observation. This is a strong recommendation based on moderate quality evidence. For selected patients with LAM with problematic chylous effusions, we suggest treatment with sirolimus before invasive management. This is a conditional recommendation based on very low-quality evidence. We suggest NOT using doxycycline as treatment for LAM. This is a conditional recommendation based on low-quality evidence. We suggest NOT using hormonal therapy as treatment for LAM. This is a conditional recommendation based on very low quality evidence. For patients whose computed tomography scan shows cystic abnormalities characteristic of LAM, but who have no other confirmatory clinical or extrapulmonary radiologic features of LAM, we recommend vascular endothelial growth factor D testing to establish the diagnosis of LAM before considering a diagnostic lung biopsy. This is a strong recommendation based on moderate-quality evidence. •dosing, patient selection, agent selection, and timing of initiation and duration of therapy of mTOR inhibitors, which include sirolimus and everolimus, and whether their combined use or use as prophylactic therapies benefits patients; and the •role of serum VEGF-D as a prognostic biomarker that can help guide treatment decisions and the development of additional biomarkers that will reduce the need for surgical biopsy, facilitate clinical trials and lead to personalization of therapies.